This is a component of the Electrical Systems. The combination switch on the steering column serves to operate the two-stage windshield wiper, the electric windshield washer, the headlight flasher and the blinker lights (turn signals). The Mercedes-Benz handbook refers to it as the Multifunction Switch also. 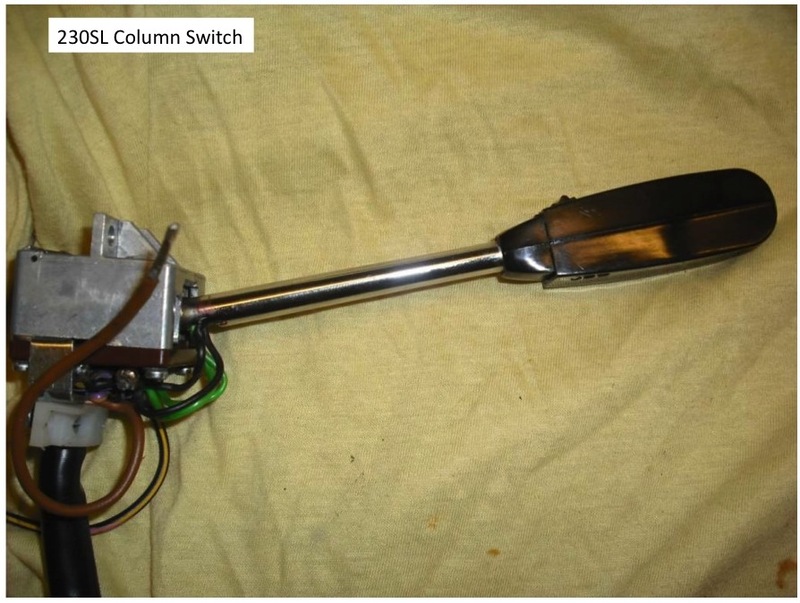 The complete unit consists of multiple parts: a combination electric switch (a) on one end, connected via a chromed lever (b) to a mechanical/electrical swivel unit (c) that is attached to the steering column jacket, and on the other end a shielded wire bundle (d) with a 12-prong male connector (e). 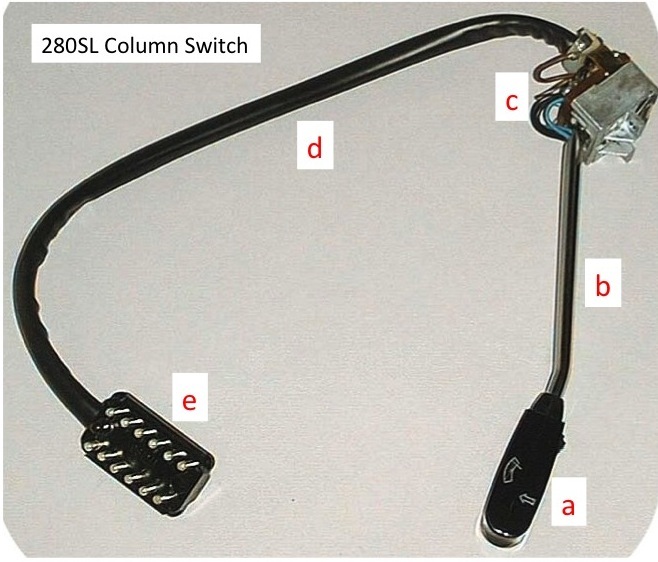 Note that the lever stalk in the 280SL switch has a kink whereas the one in the 230SL unit is straight and shorter. The 230SL switch unit is different from the 280SL switch unit and the two are NOT interchangeable! Push operation button and release (1): Windshield wiper engaged. Tumbler switch in button: push down at left (I) - normal wiper speed push down at right (II) - fast wiper speed Pushing the button again will disengage the windshield wiper, while the tumbler switch will return automatically to position (1). Swivel lever counterclockwise (2): blinker lights left. Swivel lever clockwise (3): blinker lights right. Turning steering wheel in straight ahead driving position will return lever automatically to its starting position; also possible manually. Pulling lever (4): headlight flasher; the high beam is engaged as long as lever is pulled. Note: this function is usually disengaged on US model cars! Pushing lever forward (5): electric windshield washer pump is engaged. Washer pump will run as long as lever is pushed forward. Although not necessary it helps to remove the steering wheel. The cable can be pulled through the steering column jacket without removing the connector. Once the connector has entered the jacket use your left index finger to guide/push it through the narrow passage way while pulling/twisting gently on the other end. 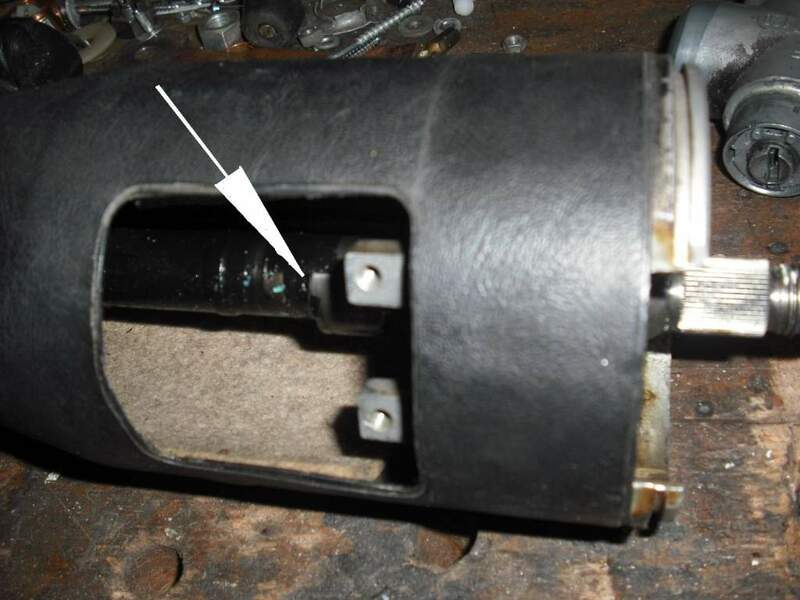 This happens frequently after removal of the steering column and re-installation. There is a plate or boss on the steering shaft that moves pin on the swivel switch back to the neutral position. 3. Turn signal lights not flashing although emergency flasher works. 6. Flash to pass (high beam flasher) feature defective. The first approach here is to bench test the individual switches using an Ohm meter. 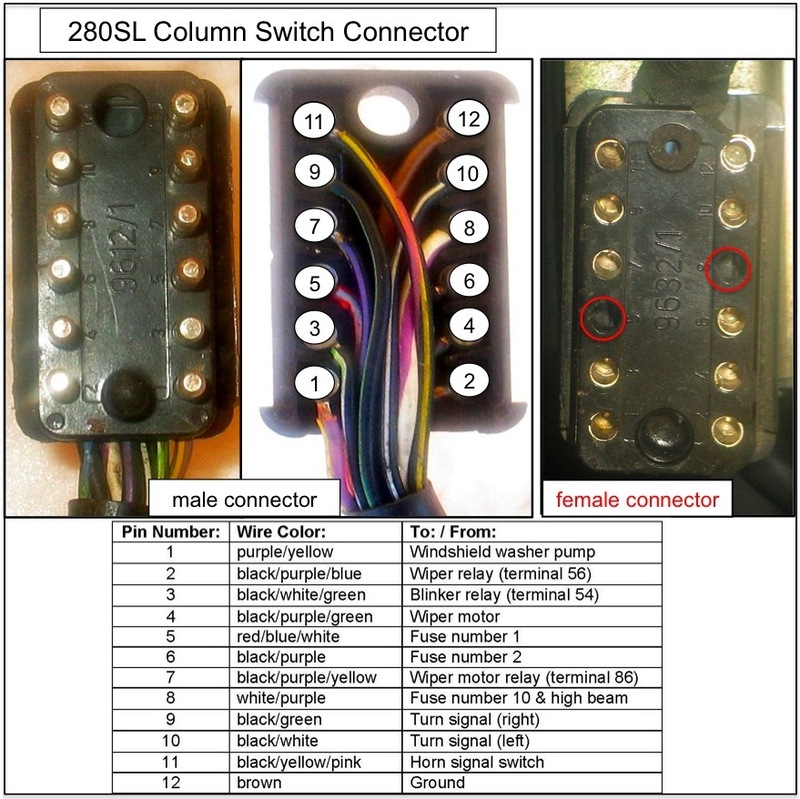 The male connector on the column switch connects to a female connector mounted under the dash board. 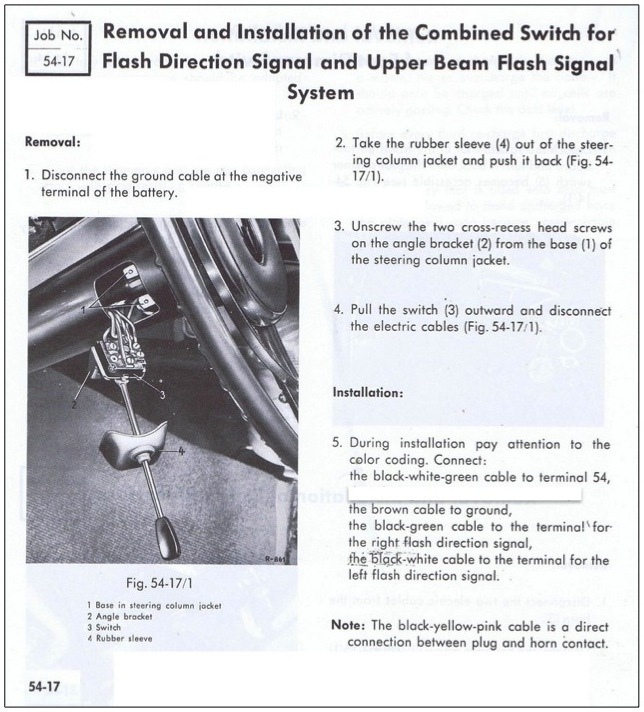 Note: Because the high beam flasher was illegal in the USA the female connector on US version 280SL cars has no wire terminals in position 5 and 8. These connections need to be reestablished for the flasher to work again.